A couple weeks ago, I wrote a post asking whether fiction writers should blog, and if so, what about. I got some great feedback, and I’ve been doing a lot of thinking and researching in the meantime. A few of you asked that I share my findings, so here are the startling facts. Keep in mind, I researched my target market. While I’m not a hundred percent who will enjoy my book, I’m guessing it will be older teens and adults, primarily women. They’d likely also read fantasy, young adult, romance, chick lit, thrillers, and maybe some horror or science fiction. If that isn’t your target market, then your statistics might tell you a different story. I found an excellent research study done by the Romance Writers of America (RWA). While I wouldn’t classify my novel first and foremost as a romance, our target markets would overlap a lot, especially readers of paranormal romance (essentially, romance with a fantasy element). I strongly recommend reading the whole study, especially if you are a self-publisher. Romance readers are the biggest subgenre purchasers of e-books and care the least about whether they’ve heard of an author or not. The study asked a lot of in depth questions about how to price ebooks, and found that if you price your book too low, readers won’t buy it, because they assume that it’s a low quality book. RWA also spent a lot of time on various media and how effective it is at reaching readers. Granted, these statistics were from a 2011 reader survey, so they are a little old, but they are so shocking I wanted to copy them in full for you. Note that blue is NOT DONE AND HAVE NO INTEREST. 83% of readers have not and have no interest in ever following an author on Twitter. Add to that an additional 13% of readers that don’t follow you and have varying levels of interest of ever checking out your Twitter account. 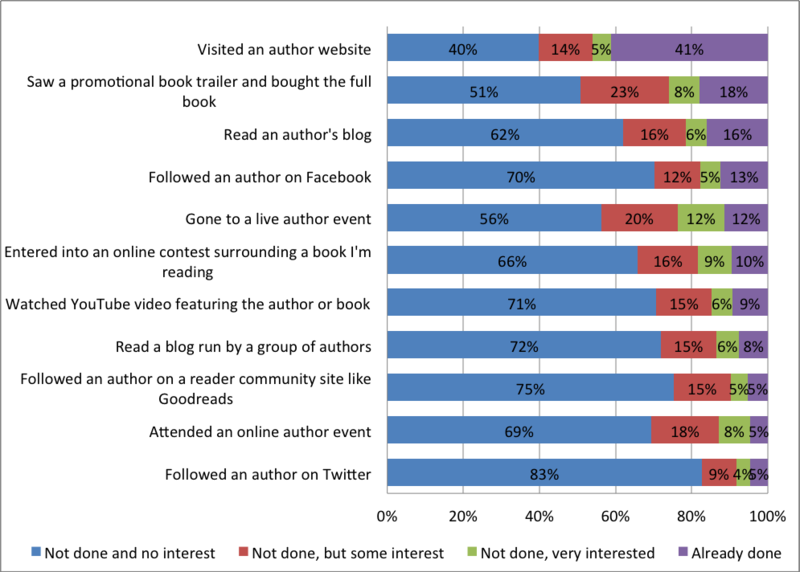 Only 6% of readers have ever actually gone to an author’s Twitter account. Guess what else they don’t care about? Your Goodreads, YOUR BLOG, your videos and trailers, your Facebook page, or your online or live events. Yes, there are a few people in each of those categories who are interested in those things, but not much. The one exception here is readers do like author websites. They like to occasionally check in to see what you’re up to, what’s coming out, and any little extra goodies you might be offering. But as for any ongoing info like a blog, Facebook updates, Twitter, etc. –not so much. After my mind stopped reeling, I thought about this. It makes sense. I only follow two author blogs of my very favorite writers. Honestly, most of the time I give their new posts a quick skim at best, and half the time if it doesn’t have anything to do with their newest book, I delete it immediately. While I have followed a number of authors on Twitter, I don’t ever look at their feeds. I think I might have clicked a Like button or two for an author’s Facebook page, but I’m quite certain I have never read an author’s status update. I’m a writer myself, and I don’t even care about these things. Why in the world would a reader? I am a busy person who is constantly inundated with media. What I really want from my authors is more books, not tweets. So if all of this media we’ve been pouring our time into isn’t what makes a reader buy a book, then what does influence their purchasing decisions? RWA asked that, too. First of all, whatever you do, don’t ever insult a romance reader. Not only do romances make up a huge part of the publishing market, they are also some of the most loyal repeat buyers. That everyone should have fans like romance readers! Secondly, are you are sure your readers are who you think they are? The other major study I found was by publishing market statistic guru Bowker. They also will let you download their 28 page report on the state of publishing for free. Want to know who buys the most books, ebooks or traditional? Hi Lara…Not that my two cents are important here, but I think we are coming to the same conclusion at about the same time. I tried unsuccessfully to express my concerns about these same things during the spring, about the time that we met. Having come to pretty much the same conclusion a few months ago…I spent a few bucks on a domain name and started a website. Way more traffic there than any of the other social media I have tried. I will not put it up here, but would greatly value your opinion of my site, you can find it on my blog if you will. I do seem to get some extra push when I do a free on Amazon thing by paying 5 bucks on Facebook to ‘Boost’ a post, but other than that I think that you are right on the website vs other media point. Like you, I write, but only follow one author on Twitter and have never read a post? Am curious to see what your other readers post on this. Hey Chris, I sent you an email with my thoughts on your website.